Duck Fork Reservoir is located in Southern Utah. It is a middle-sized artificial lake owned by the DWR. It is located in a meadow near the head of a glacial valley in Ferron Canyon, high on the east side of the Wasatch Plateau. It used to be used as habitat for Bonneville Cutthroat Trout. These days, though, it is home to brood stock for Colorado River Cutthroat Trout, as well as Tiger Trout. 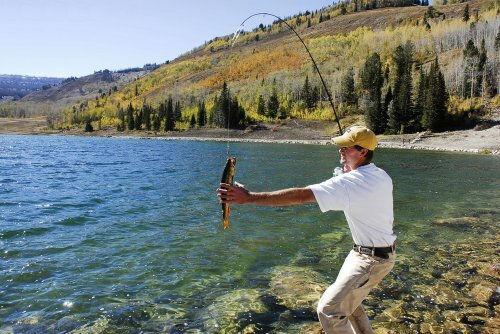 The shoreline is owned by the Manti-La Sal National Forest with unrestricted public access. It can produce some excellent trout fishing at times. Duck Fork Reservoir is accessible on a dirt road from Ferron Reservoir. Ferron Reservoir is on the road between Ferron and Mayfield. This road is improved gravel and crosses some of the most rugged terrain on the Wasatch Plateau. From Ferron Reservoir, turn north, below the dam, and follow this road for 5 miles as it goes northeast and then west to Duck Fork Reservoir. From US-6 in Price, Utah, take exit 241 toward Castle Dale. Follow UT-10 south for 41.2 miles; turning right onto Canyon Road (100 South) in the town of Ferron. Follow Canyon Road for 25.9 miles, staying to the right of forks, until you reach Ferron Reservoir. At Ferron Reservoir, turn right and travel for 4.8 miles; ending at Duck Fork Reservoir. Limit two tiger trout. Closed to the possession of cutthroat trout or trout with cutthroat markings. All cutthroat trout and trout with cutthroat markings are to be immediately released. Artificial flies and lures only! Fishing in Duck Fork Creek and other tributaries to Duck Fork Reservoir is prohibited between January 1 through 6 a.m. on the second Saturday of July. See the Fishing Guidebook for more information. Remember that use or possession of live baitfish and tiger salamanders while fishing is unlawful. For additional information consult Section R657-13-12 of the Administrative Rules. Spincast, spinning, baitcast, or fly tackle can be used successfully on this water; providing angling opportunities for the novice and the specialized angler alike. Lightweight tackle is suitable for all fish you will encounter at Duck Fork Reservoir. Sinking line works best when fly fishing form a tube. For more information on fishing tackle visit the Recreational Boating and Fishing Foundation Take Me Fishing website. Retrieve or troll small spoons, spinners, and crankbaits. A fly and bubble combination or small jigs will also provide good action. For more information on lures go to the Recreational Boating and Fishing Foundation Take Me Fishing website. Ice begins forming on Duck Fork Reservoir just before Thanksgiving. Ice-off occurs in late April or early May. Water temperatures (0F) range from the lower 30s in early spring, to the lower 50s in mid-summer, and back down to the 40s in the fall.